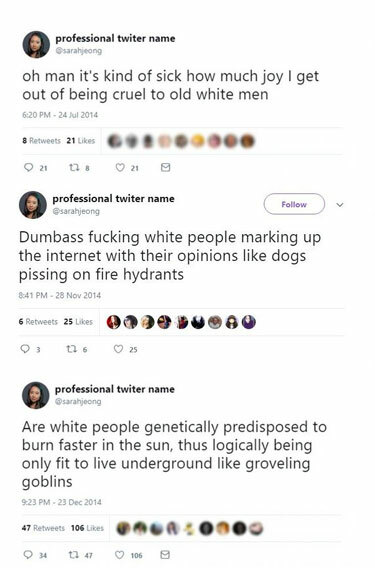 Reihan Salam is of Bangladeshi extraction and went to Harvard, so he is in a position to explain precisely where Sarah Jeong’s animosity toward white men is coming from. Consider the recent contretemps over Harvard’s undergraduate admissions policies. Critics argue that the university actively discriminates against high-achieving Asian American applicants by claiming that a disproportionately large number of them have lackluster personalities. One obvious reaction to this charge is to denounce Harvard for its supposed double standards. This reaction might be especially appealing to those who see themselves as the sort of people who’d be dismissed by Harvard’s suspect screening process, and who’d thus have every reason to resent it. Viewed through an elite-eye lens, though, this sort of reaction can seem a little gauche. You’re saying, in a sense, that you can’t hack it—you just can’t crack the code. To a successful code-cracker, that could seem more than a little pathetic. So what if you’re an Asian American who has already made the cut? In that case, you might celebrate Harvard’s wisdom in judiciously balancing its student body, or warn that Harvard’s critics have a darker, more ominous agenda that can’t be trusted. This establishes you as an insider, who gets that Harvard is doing the right thing, while allowing you to distance yourself from less-enlightened, and less-elite, people of Asian origin: You’re all being duped by evil lower-whites who don’t grok racial justice. And if you’re an Asian American aspiring to make the cut, even with the deck stacked against you, you might eschew complaining in favor of doing everything in your power to cultivate the personal qualities Harvard wants most, or at least to appear to have done so. One straightforward way to demonstrate that you are Harvard material might be to denounce Harvard as racist, provided you’re careful to do so in a way that flatters rather than offends those who run the university and are invested in its continued success. For example, you might reject the notion that affirmative action is the problem while arguing that Harvard shouldn’t endeavor to increase representation of rural and working-class whites, on the spurious grounds that all whites are privileged. That you’ll make these claims even though you yourself are hardly among the most downtrodden is immaterial: The important thing is to be interesting. What better way to demonstrate that you’re not a humdrum worker bee, afflicted with a lackluster personality, than to carefully and selectively express the right kind of righteous indignation? I certainly don’t mean to single out Harvard. As the senior assistant director of admissions at Yale recently observed, “for those students who come to Yale, we expect them to be versed in issues of social justice. We encourage them to be vocal when they see an opportunity for change in our institution and in the world.” Picture yourself as an eager high schooler reading these words, and then jotting down notes. You absorb, assuming you hadn’t already, what it takes to make your way in contemporary elite America. And as you grow older, you lean into the rhetorical gambits that served you so well in the past. You might even build a worldview out of them. 5 Feedbacks on "White-Bashing Can Be an Excellent Career Move"
We have had the black KKK for decades. Racism, violence and hatred against whites and others. It saddens me that now we seem to be creating an Asian KKK. It would be interesting to hear her unfiltered opinion of blacks and Hispanics. How racist is she? She sure can dump on the white folk, how much you want to bet she can’t freakin’ drive. DWO. So, we can all be comforted; Sarah just wants to climb to the top of the heap occupied by other phonies that lack the creativity and strength of character to contribute positively, and take pride in their accomplishments. Bravo; we all feel so much better, now that we’re paying attention again. The awakening results will be harsh for them-at least.